Our Hermit Road adventure in Grand Canyon National Park began at 8:00 am, and by the early afternoon, we had walked the Canyon Rim Trail from scenic viewpoint to scenic viewpoint for hours, visiting the Trailview Overlook, Maricopa Point, Powell Point, Hopi Point, Mohave Point, and finally The Abyss. After peering down the nearly vertical drop at The Abyss, our feet were tired and the kids needed a break. So we hopped on the free park shuttle for a ride to Monument Creek Vista. At the small Monument Creek Vista, you can look over the edge of the canyon to see Monument Creek traveling to the Colorado River to create some pretty violent rapids. Monument Creek Vista also marks the start of the Greenway Trail. 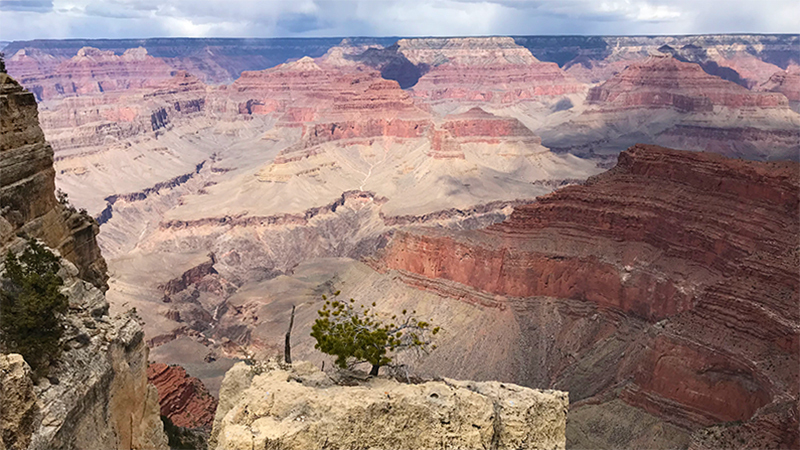 From this viewpoint, the dirt Canyon Rim Trail turns into the nine foot wide, paved, accessible Greenway Trail that travels three miles to Hermit’s Rest at the end of Hermit Road. Open to hikers, bikers, and visitors using wheelchairs and strollers, the Greenway Trail follows the 1912 alignment of Hermit Road and has six overlooks and multiple rest areas. For a quick second, we considered walking the 1.75 miles to Pima Point and another 1.25 miles to Hermit’s Rest on the trail, but all of us were a little tired, it was really cold, darker clouds were moving in, and the snow flurries were getting stronger. So, after a snack break, instead of walking all three miles, we hopped on the shuttle to Pima Point and planned to walk the rest of the way to Hermit’s Rest from there. Monument Creek Vista is located on Hermit Road west of Grand Canyon Village, Arizona 86023 in Grand Canyon National Park, Coconino County. The nearest restrooms are at Hermit’s Rest.